Yesterday was the launch of THE HUNGER GAMES TRIBUTE campaign. Per Lionsgate, this is “a celebration of the dedicated fans that have made this franchise a global phenomenon.” Participants get a chance to win tickets to a Global Fan Appreciation Event in Los Angeles in late October (contest is US only but we presume a livestream will make it “global”). To participate, you can go the easy route and just vote in some of the categories, or you can submit your own fan works. We were some of the lucky few who were asked to help whittle down the nominees, and it was tough because there’s a lot of great fan work out there. Each week will have different categories and we’re happy with 4 of the 5 this week. 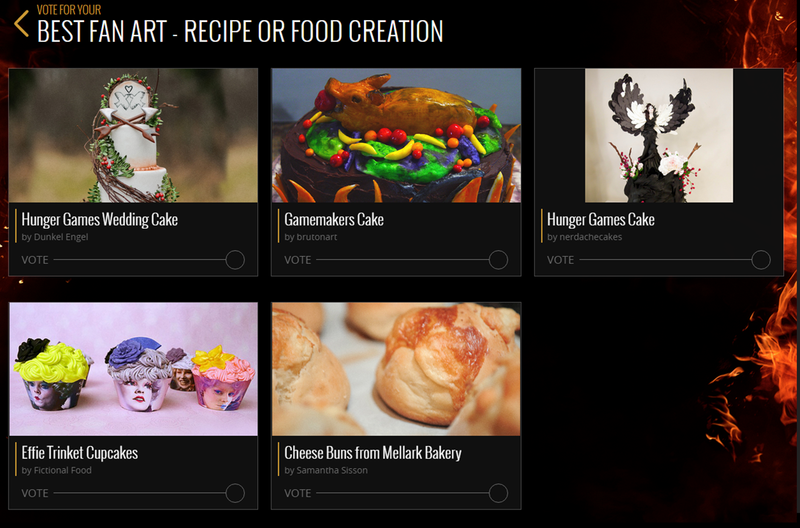 There’s some awesome fan art whether it’s drawing/painting or people channeling their inner Peeta with the edible variety. 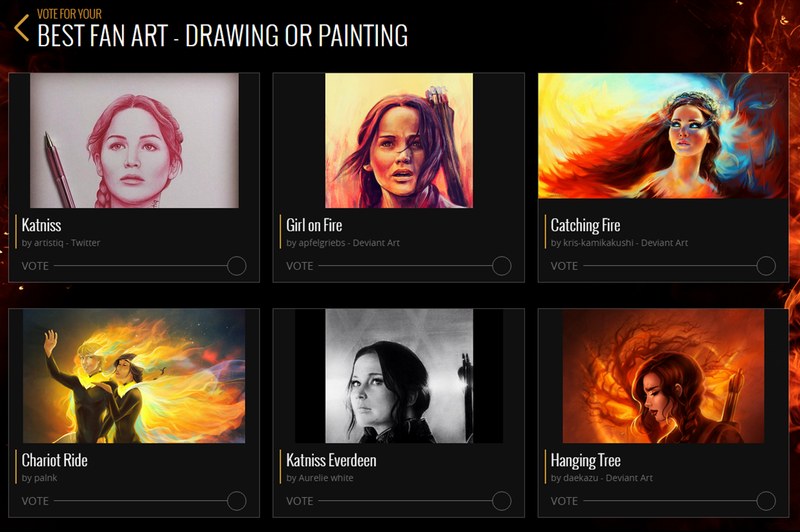 And there’s movie scenes to vote for – Best Katniss Moment and Best Action Sequence. It’s all good fandom fun. Well, it’s nice, fandom fun until we get to the Best Trailer Parody category. Most of these we enjoyed – they exaggerate and poke a little fun at the movies, but harmlessly. The Lego one is creative and lots of fun. “Jon Snow Must Die” is a great crossover if you’re a Game of Thrones fan. Literal Hunger Games, a little biting, sure, but still funny. The Honest Trailers Catching Fire video takes a lot of jabs at the movie but doesn’t come from a hugely mean place. The Honest Trailers Mockingjay Part 1 video though. Why on earth is this a part of this awards? We have to wonder if anyone at Lionsgate actually watched this video before adding it to the contest. We almost don’t want to bring it to anyone’s attention. Just let it lose and hopefully not another soul watch it. But since it’s up there we have to think it’s getting some good extra exposure by being a part of this campaign, so we’ll address it. It’s so out of place. This video is four + solid minutes of hating on the movie. That it’s boring, a waste of time, Katniss cries too much, etc. Bottle up all the overblown negative reactions from that movie and put it in a video, that’s this one. You really get the sense that the video makers HATED the movie. Oh, and just for good measure, throw in a gross joke about Jennifer Lawrence’s picture hacking at the end. We can handle people hating on Mockingjay Part 1, some people aren’t as invested in this journey as us, we get it. But adding in Jen’s picture hacking as a joke at the end really pisses us off. Sure, Lionsgate could argue that “fans” nominated the video, but I’m sure somewhere in the extensive official rules, you’d think Lionsgate & Samsung would put in the ability to have some control over the nominations in cases such as these. And you’d think they wouldn’t want to include a video that makes light of a serious crime that happened to their lead actress. Moreover, Honest Trailers does videos for practically every big movie. It’s not that they are Hunger Games fans, they’re in it for the views. And the views may be why they included that awful joke, but it’s so out of place in a fan celebration. So go have fun and vote, for anything but THAT. You tell ’em JJ. Seriously, with some of the offensive/embarrassing marketing going on I just wonder if someone over at Lionsgate is asleep at the wheel. In some organizations, that type of negligence will get a person fired. Been having a blast going through the nominees and making my (sometimes easy, sometimes excruciatingly difficult) choices. The MJ1 Honest Trailer…I find parts of it hilarious, but obviously disagreed with much of it. And explained to them why in a long comment that they may or may not have read. However…I understand that those trailers are intentionally sarcastic and tongue-in-cheek. Some of the films they actually LIKE, including the Hunger Games ones, but must find ways to lampoon anyway because viewers expect Honest Trailers to be scathing and negative. For humor. How truly honest they were being in that one is questionable, and it’s far from my favorite one… I picked the ‘Literal’ trailer out of the voting options. It’s definitely funny, and got me frequently quoting the line “If you’d look through my eyes, you’d know that those eyes were mine, ’cause of the blonde hair on the sides!” xD Deep, deep stuff there, Haymitch. OH, and as a “Throny,” I strongly considered picking “Jon Snow Must Die”…rather clever little crossover. But the lack of a Margaery/Cressida reference of some sort felt like too much of a missed opportunity…not to mention Brienne/Lyme!